the theme is Color Blocking. I used the Stitched Square Dies in different size and colors on a black background to form my color block project. After laying out my pieces on the black background I cut the whole thing out with the largest Stitched Rectangular Frame.The sentiment is from Mini Chalkboard Tags Stamps, to finish the card off I add a couple of sequins. I really like the simplicity of this card and the bright colors. 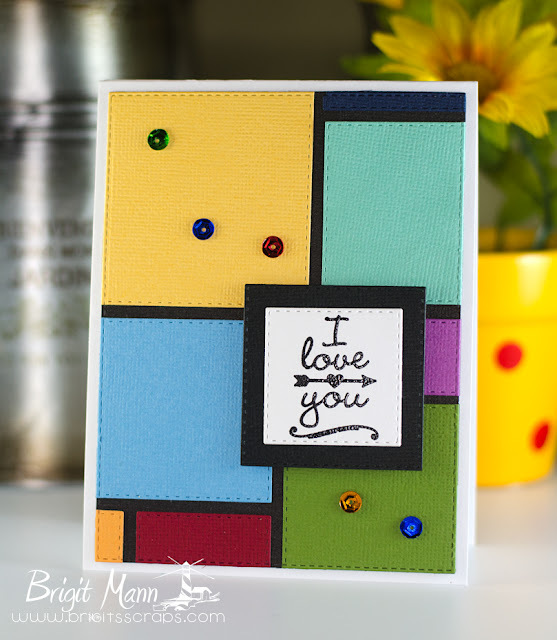 Your card is totally cool love your color blocking it reminds me of building blocks and that is a happy thought! Love the colors you chose sure makes for a happy, bright & cheery card. YOU so ROCK!! So super cool. That would be a great use for all those scraps we keep around. Just awesome! Love the layout and bright colors! I love the look of your card! Great for using up scraps...It could be manly...good design for birthdays or almost any kind of card. Beautiful job. Brigit ~ Well this is just AMAZING! Bright, cheerful and happy and sort of reminds me of the Partridge Family ~ yep I am that old and LOVED those colors too! Believe - Sandy Allnock's Go For The Gold Class!